Fishing in Hawaii is a Fun and Free Way to Enjoy Any Day. 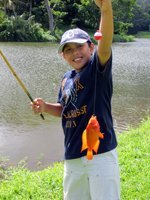 Fishing in Hawaii is Free Hawaii Family Fun! Back in the old days (before Nintendo), I had to do things for fun; and fishing in Hawaii quickly became my favorite pastime. I’m talking about real water, real bait, and real fish-smell on my hands. There wasn’t an app for that, and I didn’t mind. After all, what could be better than hanging out in the warm Hawaiian sunshine enjoying a cool breeze and some of the most beautiful shorelines you find anywhere in the world? If you’ve ever heard Brad Paisley’s I’m Gonna Miss Her, you know what I mean. The guy who wrote that was a genius! Anyway, for a kid with only a bicycle and a bus pass, Hawaii fishing was an appropriately portable hobby as well. Because I grew up across the street from Kaneohe Bay, that was one of my primary fishing spots. However, that location isn’t any better or worse than anywhere else on Oahu; it was just more convenient. I’ve been fishing in Hawaii throughout much of the state and around most of Oahu. I’ve gone fishing from a boat, off a pier, from the rocks, or wading out to the reef – and every spot has both good and bad points. I mention this because this page is not designed to help you find all the so-called “secret spots” that only locals know. Those will remain hidden for now. But if you’re on my site because you want fun and free family activities to do in Hawaii during your Hawaii vacation, I’m going to try to make that as easy as possible for you. You wouldn’t be allowed to use better tackle even if you had your own. They don’t allow casting or hooks with barbs. 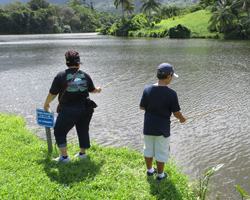 This is the easiest way for you to enjoy fishing in Hawaii because Hoomaluhia provides the gear. It’s just bamboo rods with a line, bobber, and hook tied to each – but it’s gear you don’t have to rent or purchase and it’s all you need to catch plenty of fish from the grassy shore. 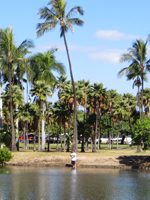 Furthermore, Hoomaluhia is the only freshwater Hawaii fishing that doesn’t require a license or permit. You’ll have to bring your own non-live bait, for which I suggest that you purchase the cheapest loaf of white bread you can find. You are also encouraged to wear good walking shoes, because it’s a 15-minute trek from the office to the fishing area (or longer if you pause to appreciate the scenery). 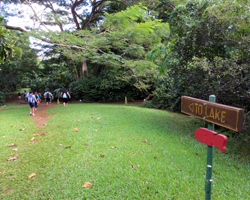 The walk is not guided, but there are signs marking the route all the way to the pond. You won’t get lost. Keep in mind that if it has been raining recently, it could be muddy and/or slippery. 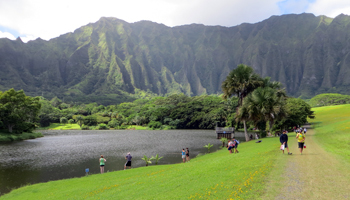 Be aware that Kaneohe is located on the rainier windward side of Oahu (which is why it’s so lush and green), so you might need an umbrella or rain coat and insect repellent. Otherwise, you’ll probably need sunscreen, a hat, and plenty to drink. You’re encouraged to bring your own picnic lunch, because there’s nowhere to buy refreshments on site. There are restrooms at the office, so make sure you use them before you get to the pond. FYI: The last time I did this with my kids, we caught 10 fish between the three of us; and all the other kids that were in the group with us caught multiple fish as well. I can’t guarantee that you’ll catch something, but the chances are good. If you have your own gear and/or you really want to boost our economy by buying some while you’re here, your options open up as to where you can go fishing in Hawaii. If you’re a big fan of freshwater sport fishing, though, you should plan a trip closer to home. It will likely be better there. And most freshwater fishing here requires that you get a permit/license (except as noted above). 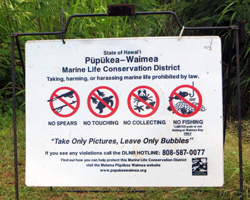 It may be necessary to obtain a permit/license for non-standard marine recreational fishing in Hawaii. If this is your interest, check here first (link opens a new window/tab). However, since you’ll be on family vacation in Hawaii, I’m going to keep things simple. I’m going to talk about standard rod and reel fishing from the shore. You’re welcome to charter a boat for deep sea fishing, but that’s not free and, thus, it’s not on topic. Furthermore, I’m not going to talk about which kinds of baits and lures will work best for each type of fish. That takes years of experimentation, and results vary from one location to the next. So, basically, I’m going to assume you have only light tackle that could easily be packed in luggage and/or purchased as a starter kit at any store with a sporting goods aisle. 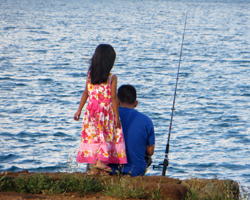 In general, there is no license or permit required (adult or child) for marine recreational fishing in Hawaii. Probably the only restriction you’ll need to worry about is the location. If the area is a marine sanctuary (which will be clearly indicated on signs posted at the location), don’t fish there. Examples of this would include Hanauma Bay, the Pupukea Marine Life Conservation District, and much of Waikiki Beach (but, honestly, if you tried fishing in Waikiki, you’d only catch another tourist anyway). If you are greatly concerned about all the regulations at all the major fishing locations, you can get more information here (link opens a new window/tab). Other considerations for choosing the right location to go ocean fishing in Hawaii tend to revolve around your personal water safety and health. If the surf is threatening to sweep you out to sea, don’t fish there. If you’re going to fall down a cliff, don’t fish there. 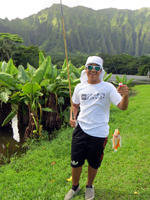 And I wouldn’t want to eat fish caught around certain higher pollution areas such as Pearl Harbor, Honolulu Harbor, and Ala Wai Boat Harbor; but if you’re just planning to catch and release, you don’t need to worry about that. Bait. You can buy frozen squid (calamari) at most grocery and fishing supply stores. You can buy frozen aku (bonita tuna) belly at most fishing supply stores. Worms and insects won’t work. White bread works for many kinds of reef fish (and tilapia), but not for the popular sport fish. Live bait works best, but you have to catch it yourself. You can’t buy it from a bait shack. Hooks. Ocean fish tend to have small mouths. You’ll find that what you consider to be standard-sized hooks are too big; and for typical reef fishing you’ll often use hooks in the size range of 13 to 20. Line. I don’t know if ocean fish are smarter or if they just see better than freshwater fish (perhaps because of our clean ocean water), but you’ll find yourself needing to use very lightweight tackle just to get a nibble. I rarely use heavier than 6 lb test line for any standard reef fishing. Coral. Once tangled, your line will never come free. Furthermore, losing your tackle in a reef tangle is damaging to the coral ecosystem. Don’t get tangled. Density. The ocean is a big place. 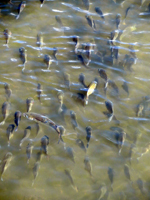 The fish can go anywhere and they have lots of food options available. You’re going to get a lot less action than in the typical stocked pond. 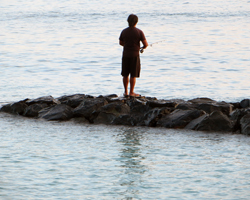 With these challenges in mind, you may decide to enjoy a few simple hours of catch and release at Hoomaluhia. But if you’re just looking for an excuse to enjoy a gorgeous day out on the water, you won’t care if ocean fishing is more difficult. Even the worst day fishing in Hawaii is better than the best day at work back home. So get out there and start thinking up some fish stories about the big one that got away! Disclaimer: this is not a complete list of every regulation relating to fishing in Hawaii. It is your responsibility to ensure that you are following all applicable laws and avoiding all restricted areas, whether signs are clearly posted or not. Your personal safety is also your own responsibility. Exercise good judgment. Heed all applicable warnings. Use plenty of sunscreen and wear protective clothing. Pack sufficient refreshments and then properly dispose of all trash. Failure to adhere to these guidelines could result in legal, health and/or safety complications that you would rather avoid on your Hawaii vacation.